Are you looking for a convenient mess kit for your next camping trip? The Stansport 1 Man Aluminum Mess Kit will allow you to cook and serve your favorite mouthwatering outdoor meals. Use the fry pan with handle for scrambled eggs and sausages and the pot with lid to cook up baked beans and rice. 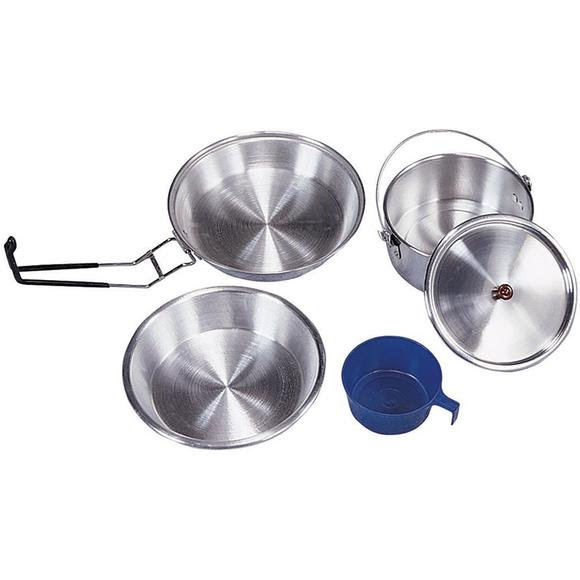 Are you looking for a convenient mess kit for your next camping trip? The Stansport 1 Man Aluminum Mess Kit will allow you to cook and serve your favorite mouthwatering outdoor meals. Use the fry pan with handle for scrambled eggs and sausages and the pot with lid to cook up baked beans and rice. Transfer your delicious meal onto the ridged aluminum plate and your favorite beverage into the plastic cup. All of the items nest together for easy carrying and storage of the entire set. Stansport&apos;s 1 Man Aluminum Mess Kit is the perfect set to cook and enjoy outdoor meals on the go!